Ahhh that moment in time when your little princess grows up & wants privacy! From personal experience this kids doorbell works great for a family with multiple kids…since we all know kids love to push buttons but not knock. We also used it to wake up kids….just push the button as you stroll down the hall in the morning. It’s loud enough to wake the kids but you really can’t hear it in other rooms so no one else is bothered by it. It also works for bathroom doors…if you have a small herd of non-knocking kids it really does cut down on unwanted barge ins. 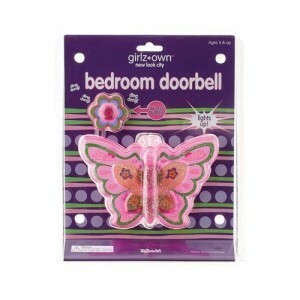 This groovy kids doorbell is perfect for little people aged 4 & up looking for a little space of their own. It has a 6.5′ thin cord that can be hidden up the molding of just about any door. 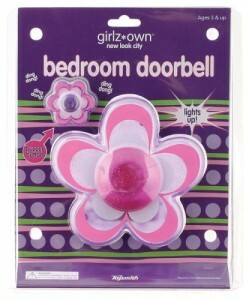 it works just like any doorbell, it has a button that sets off a loud chime & lights up. It features a Daisy Flower Design with pink & purple accents…however it also comes in Butterflies, Princess Crowns or even boys themes (they love them too). They are a great gift for any kid with a door…literally every kid I have ever had over wanted one for their rooms. It’s super easy to install since it comes with double sided sticky tape on both the chime & button. It’s pretty tough we had one up for about 4 years with no problem. It didn’t damage the wall or wood door jam when we removed it either. It needs 2 batteries but they seem to last about 2 years so not a big hassle. These aren’t super pricey so expect what you pay for… according to the reviews some people have gotten defective doorbells. Frankly we have purchased 8 for our kids, & friends kids none have ever been an issue & none were defective.